http://www.tcd.ie/artcollections/academic-collections/ Engineering models of the float and shear legs used to operate the Dublin Port Diving bell and block float used to lay the elements of the piers at Dublin port. Model of the Diving bell is in St Andrews resource centre in nearby Pearse street. This is also the burial place of the divers Spalding and Watson who lost their lives in 1783 bell diving on the Belgioso. Their graves are unmarked and exact location is unknown. Sligo also the Bantry Yawl – Admiral Neilly’s Barge captured during the expedition to Bantry Bay. http://www.commissionersofirishlights.com/cil/publications/beam-magazines/volume-29/baily-lighthouse-museum.aspx Private collection relating to Commissioners of Irish Lights and lighthouse equipment, by invitation only, not open to the public. http://www.howthcoastguard.com/pages/thomas-woodley-medals Exhibition relating to lifesaving and award of Tayleur medal to Coastguard Woodley. Display of Woodley’s medals. There is a memorial to fishermen and others lost at sea including some of those lost in wartime in the car park between the two piers. http://www.guinness-storehouse.com/ Material relating to Guinness ships and Liffey Lighters. Also film of canal barges used to transport beer. Archive of photos, ships bells and fragment of bomb which struck ship during WW2. Headstones mark the burial place of the victims of this 1807 disaster ( see elsewhere on this site) at Monkstown cemetery (access key with electrical shop at eth bottom of the hill). Dalkey Heritage centre (churchyard adjoining the castle) and Williamstown cemetery beside the Tara Towers Hotel on the Merrion road. .
Anchor from RMS Leinster on plinth near Carlisle pier from whence she sailed before being torpedoed in November 1918. (Click here to read about the loss of the Leinster) Also on the east pier is the Ajax memorial to seaman from HMS Ajax who lost their lives attempting a rescue. Statue and grave of Boyd who died in the attempted rescue from shipwrecks at Kingstown (Dun Laoghaire) in 1861. Small obelisk commemorating those who died in the rescue attempts in 1861. About 70 graves of the military casualties of the torpedoing of the Leinster,1918. http://www.arklowmaritimemuseum.com/ Collection relating to Maritime Arklow, Arklow shipping and Tyrell boatbuilding. 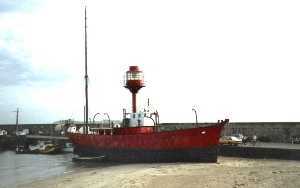 Lightship Skua moored nearby. Rifled muzzle loaders mounted on concrete plinths near site of Wicklow coastal artillery battery, two further cannon at another site near war memorial on road to port. http://hookheritage.ie/ Display of material relating to light keeping at this, possibly the oldest lighthouse in Europe. Tower open to public. Nearby at Foulksmills is the beached Waterford harbour dredger Port Lairge (Built Dublin 1890) with its 1890 steam engine intact but otherwise decayed. Exhibition, several fine figureheads, aboard lightship Guillemot moored in concrete at Kilmore Quay, many trawled artefacts on seafromt, Nearby on seafront memorial to those lost at sea from all causes including in wartime. The museum ship has been cut up on site and the fate of the collection is unknown. Coastal fort and artillery recently reopened to the public, search website for opening hours. Cotters Pub in Crosshaven has a collection of photographs and artefacts. Memorial in Cobh co Cork, memorial on Old head of Kinsale, headstone on main burial at Cobh Cemetary, some graves at St Multose church Kinsale. There is a small museum in Methodist church with material on Cobh. An exhibition on emigration is in the old railway station just beside the White Star pier. The Commodore hotel has many artefacts. Lusitania oar and lifebelt in Castletownsend church, also memorial to Admiral Somerville and other members of this naval family. Collection of material recovered locally from Kowloon Bridge etc Many photographs. More correctly the fog signal station is open to the public. Extensive display of lighthouse keeping with maritime artefacts. Cannon lifted from the nearby wreck of the Impatiente. Following repair of the bridge access resumed. Figurehead and bells from ships wrecked locally in market house in centre of town including cannon retrieved from shipwrecks. Several Lusitania artefacts. In old church off road into town contains paintings of cork harbour Contains photos of US fleet in cork during WW1. Display on cable laying in 1890s from Valentia, you can see the cable on a beach nearby and the buildings of the cable and radio station survive. Church erected with assistance from rescued sailors of Leon XIII, wrecked offshore in 1907, the bell at altar is the ship’s bell. The main finds from the wrecks of Trinidad Valencera and Girona of the 1588 Spanish Armada including siege gun and vast array of jewellery and artifacts. Armada cannon from the Trinidad Valencera and material from HMS Wasp wrecked at Tory Island. Models and material relating to loss of Connemara and Retriever and Newry shipping. Memorial stone over graves of HMS Laurentic victims at Buncranna. The Bell is in the church at Rathmullen. Armada cannon and artefacts from Trinidad Valencera. Formerly a RNVR base the degunned cruiser is the last survivor of the Battle of Jutland. Not accessable currently, a project to move the vessel to Portsmouth is under consideration as alternative to display on site. The remains of the Harland and Wolff shipyard in Belfast where the Titanic was built, Thompson graving dock, drawing office, New Titanic exhibition centre in modern building. Two huge shipbuilding cranes (Sampson & Golliath) which replaced the Arol gantries about 1960. A project in early stages being prepared by a local group in a former lifeboat house near the harbour based on Balbriggan Maritime heritage.